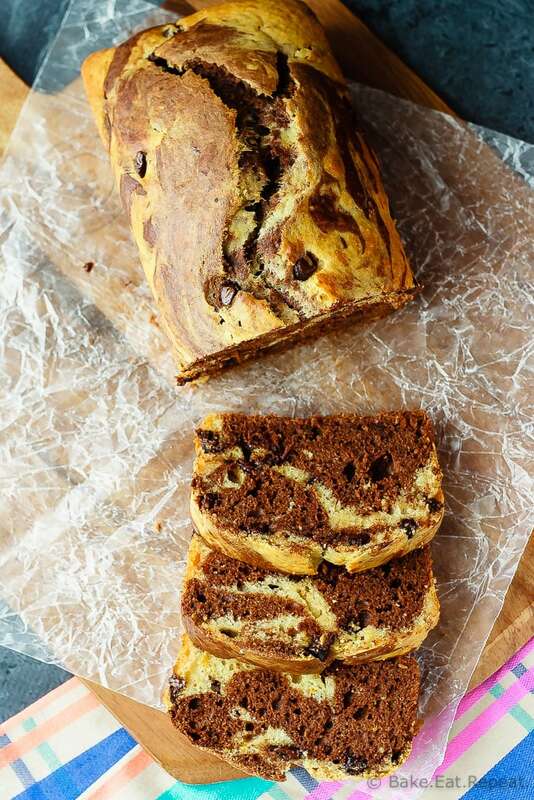 Marbled Chocolate Orange Bread - Bake.Eat.Repeat. 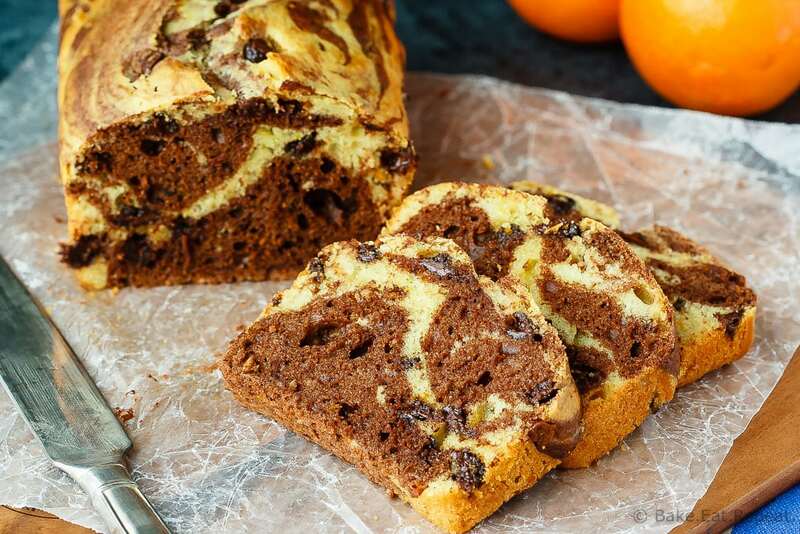 This marbled chocolate orange bread is an easy quick bread that is light and fluffy and full of chocolate and orange flavour. I think quick breads are maybe my favourite thing to bake. Muffins, scones, biscuits, breads – they’re all awesome. This marbled chocolate orange bread though? It just may be one of the best ones to come out of my kitchen yet. Although I might just say that about almost every quick bread I make. I did say that I love them. My daughter seems to have inherited that love. She’s ten, and has recently taken to asking if she can make muffins almost every week. Sometimes more often. That’s fine with me, we seem to run out of them almost as fast as I can make them! Plus, they’re such a great thing for kids to make. Muffins are easy enough that she can do everything by herself and they pretty much always turn out. It’s hard to mess up with quick breads. This marbled chocolate orange bread is another very easy quick bread to make (aren’t they all?). Maybe a little bit on the festive side. Something about the chocolate and orange together – totally makes me think of Christmas. But you know what? Chocolate and orange are fantastic together and definitely should not be relegated to the holiday season. It’s too great a combination to only be enjoyed one month out of the year. That’s just a fact. It’s also a fact that you need to make this bread. Now if not sooner. It’s light and fluffy, it comes together quickly and is in the oven in under 20 minutes. 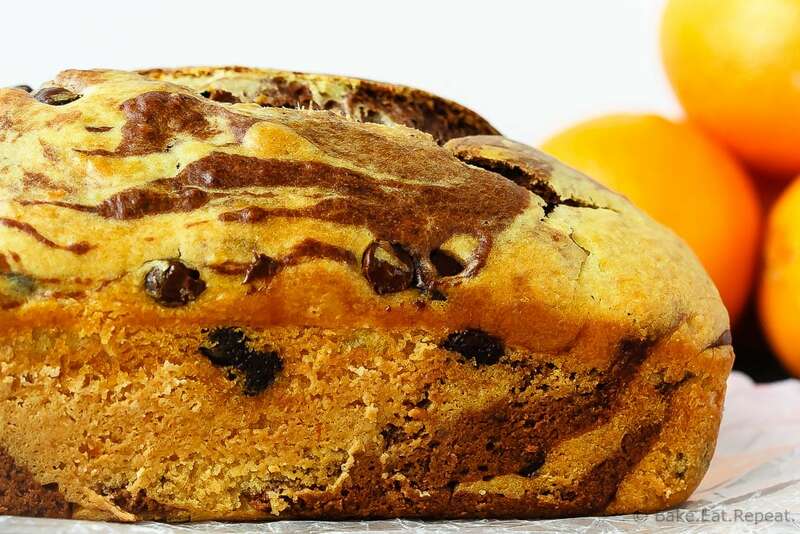 Full of chocolate and orange flavour and studded with chocolate chips, it will be hard to stop eating after one slice. I know we polished off this loaf in less then two days. That’s okay though – I’ll just get my daughter to make me some more. She’s as addicted to baking quick breads as I am anyways. I’ve also shared this Marbled Chocolate Orange Bread recipe over on Food Fanatic. I love making quick breads as well! So easy and so delicious! This bread sounds so delicious! I make a chocolate chip banana bread (banana bread is my FAVORITE) with a bit of OJ in it but I love how the orange and chocolate are the stars here! And those chocolate swirls are gorgeous! I'm putting this on the 'to-bake' list! Quick breads and muffins are my favorite. I just love the endless flavor combinations! This marbled chocolate orange version looks incredible, Stacey! I've never had anything quite like this, so I'm loving your creativity. Sounds perfect for breakfast or dessert! Yum, I'm loving the chocolate and fresh orange flavor of this bread. It's not a combo I use often. Looks delicious!